My usual vehicles for chocolate fixes are 72 percent dark chocolate bars from Whole Foods. Last week, I ran out — a rare occurrence. That left me to figure out what to do with cocoa (which I always have) that would provide a chocolate fix with a minimum of carbs. The first experiment yielded dry, uninteresting brownies. 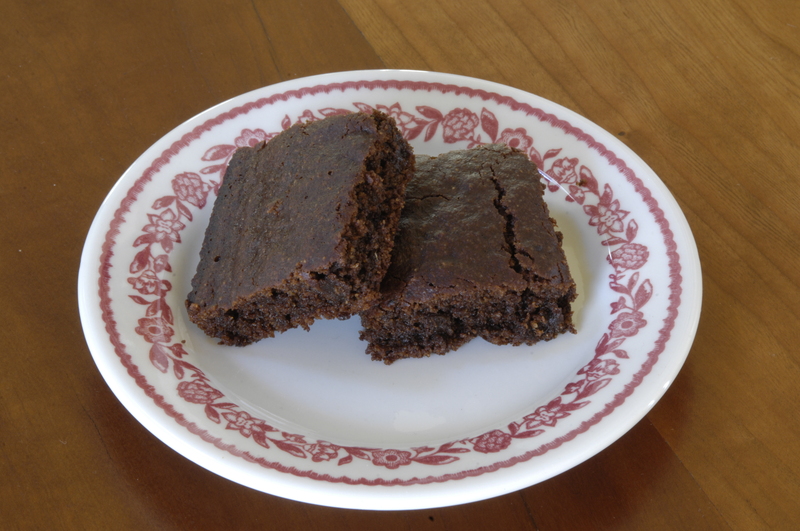 I realized that, if you reduce the amount of fat and sugar, the brownies are no fun. Then I thought of apple sauce (or apple butter). It was easy to make that connection because my favorite cake since childhood is a chocolate apple sauce cake in which the only liquid ingredient is apple sauce. There aren’t even any eggs in the cake. The pectin in apple sauce is a remarkably good replacement for eggs. For the flour, substitute whole wheat flour or any flour. Apple sauce or apple butter would work equally well. Honey or even molasses would work as well as maple syrup. Any kind of oil, or even butter, could be substituted for the olive oil. Mix everything together and pour the batter into an oiled 8-inch baking pan. My brownies needed about 25 minutes at 350 degrees. They’re done as soon as they pass the toothpick test. I wouldn’t say that these brownies are chewy, exactly. But they’re very moist and satisfying. They’re also cheaper than chocolate bars. This was written by daltoni. Posted on Tuesday, February 5, 2019, at 3:04 pm. Filed under Food. Bookmark the permalink. Follow comments here with the RSS feed. Trackbacks are closed, but you can post a comment. I make banana bread and substitute half of the butter with apple sauce. Very good. Your posts with substitutes for carbs, fats, etc. are very helpful. It is obvious you follow a healthy diet.